If you want to configure a machine's Daemon to use settings other than the default ones, you can configure these values using the Daemon Setup dialog box. On the Config menu, click Daemon Setup. In the Local Daemon section, highlight the contents of the Port box, and type the appropriate port number. 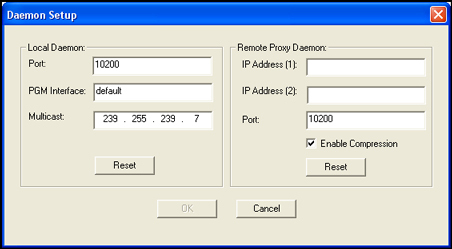 In the Remote Proxy Daemon section, highlight the contents of the Port box, and type the appropriate port number. In the Local Daemon section, highlight the contents of the PGM Interface box, and type the secondary IP address.